The continued controversy about the "Confederate Flag" flying over historical landmarks in the South, such as the South Carolina State House building in Columbia, South Carolina, took on a renewed and painful sting following the Charleston church shooting on June 17th last week. 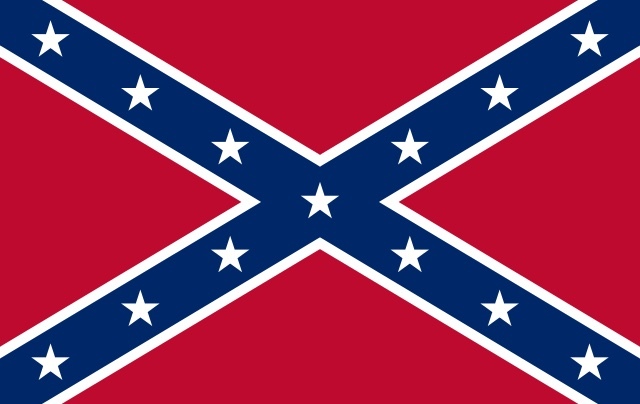 It's also an issue mired in confusion since what many of us think of and recognize as the "Confederate Flag" was never actually adopted nor universally used as such during the brief period of the Southern secession from the United States during the 19th century. What's pictured above is actually a REJECTED national flag design never approved by the Confederacy, which was subsequently adopted by General Robert E. Lee as the battle flag of the Army of Northern Virginia. Owing to Lee's popularity during and after the war, even in the aftermath of the South's defeat, his association with that flag led to it supplanting the more official "stars and bars" flag of the Confederacy in the national mindset. Pop culture has heightened that association through television shows like "The Dukes of Hazzard," where the protagonists drove a car CALLED The General Lee, with his battle flag proudly emblazoned on the roof. Versions of this logo are recognized by historical societies and the descendants of Southern war veterans, and can (as noted) be found flying over some state capitol buildings to this day. That may seem relatively harmless at face value, and perhaps even defensible as guaranteed free speech/freedom of expression, but at a deeper psychological level one has to ask what the flag represents. Civil rights groups often object to its display with good reason - it tends to evoke an ugly and racist nostalgia for segregation, Jim Crow laws, and perhaps even slavery itself. It's hard to deny objectively that the deep divide over the issue of slavery was what led to Southern secession and in fact the civil war itself, and the crimson river of blood shed over it is a stain of shame this country still bears today. Celebrating the confederate flag, or even something that in the popular mindset is associated with it, seems in fact to be celebrating that the wrong side won the war. It would be akin to flying the Nazi flag in Germany, which is in fact against the law there, because it is identified with the evil that was done in its name. It would be like endorsing the Holocaust or Adolf Hitler's leadership. As much as Southern "sons and daughters" might try to reclaim the symbol as a source of pride for the children of war veterans, there are much better symbols such as the Gettysburg National Military Park that consecrate the sacrifice made by both sides. Regardless of which side was morally right, the ground recognizes ALL those who lost their lives during the most famous battle there, as well as during the war in general. Lincoln's "Gettysburg Address" said as much. It doesn't serve a good purpose to actually make any flag illegal to display, as you'd have a hard time discussing or depicting historical events that way, but as a matter of decency you have to wonder why somebody would take "pride" in a symbol of hate and celebrate it. Dylann Roof has by his grotesque and unconscionable actions become the textbook argument against displays of the flag. He "proudly" wore the Apartheid-era flags of South Africa and Rhodesia (now Zimbabwe) on his jacket. He had a crackpot website filled with his own hate mongering manifesto. He believed whites were superior and all others were inferior, and he took it upon himself to be a leader in what he felt was an inevitable race war with a single horrifying act of violence. It's not enough to simply put him on trial and find him guilty - the HATE that he represents should be put on trial as well. If the confederate flag is a recognized symbol of that hate, it should be relegated to history where it belongs, and not worn on jackets or flown over state assemblies. People should be revolted by it. It can not be re-purposed or repackaged as "Southern pride." The post-war South has a lot to be proud of, and that flag shouldn't be a part of it. From Houston to Tampa, from Miami to Memphis, from Atlanta to Orange Mound, let's celebrate the music and culture of hip-hop that was born out of a history of pain, a triumph of the human spirit over the forces of evil. The confederate flag is anything but.